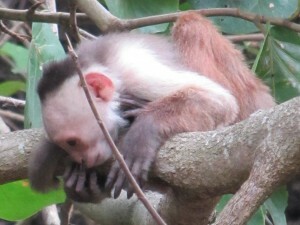 Colombian animals update : MONKEYS!!! A few weeks ago we went to “Parque Tayrona”, one of Colombia’s national parks, so we could see some extraordinary landscapes and wildlife. They don’t allow cars in the park so we had to walk to where we were staying. It was an hour and a half’s walk but we got a horse to carry our heavy bag so we were able to really enjoy the hike. We walked for about an hour up some steep slopes through the jungle without seeing hardly another person. We were quite lucky because it was early morning and a bit misty and cool for the first time in months. 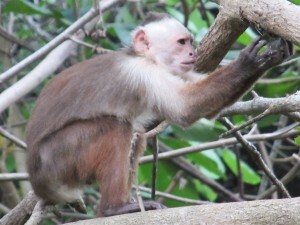 Suddenly, we turned a corner and my Mum spotted a little monkey clambering around in a tree! If you know me, you will know that I LOVE monkeys and have been dreaming about seeing them in the wild for my whole life. I managed to get a glimpse of it and I thought: ‘it’s going to go now but at least I saw it!’, but instead, it stayed right where it was! It was sitting in a tree and picking and eating berries when I spotted another one near it, then another, and another, until there were twenty monkeys hopping around in the trees above our heads!! I felt so overwhelmed I basically couldn’t speak. I felt so happy right then and I will never forget that moment when I first saw them. We stayed there for ages and the monkeys seemed really calm and they came very near us and carried on picking and eating the berries. After about half an hour of watching them, a few more visitors caught up with us and saw us watching the monkeys, but when they arrived the monkeys started jumping up and down and running off to hide. 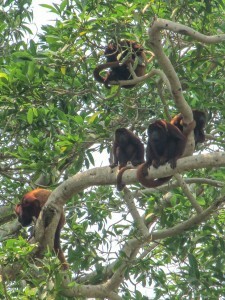 When the people left, the monkeys became more relaxed again and carried on eating and came back close to us! I think that the monkeys didn’t mind us which made me feel very special. We spent three more days in the park keeping a look out for more but we didn’t see any. We asked people working in the park and they said we were really lucky to see so many and maybe it was because it had rained the day before for the first time in months. The monkeys we saw were capuchin monkeys but there is also a kind of monkey in Tayrona called the ‘mico Titi’ and they only exist in that jungle in the whole world! Because they don’t live anywhere else in the world they are critically endangered. 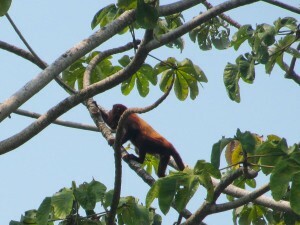 The third kind of monkey in Tayrona is a howler monkey. After seeing the capuchin monkeys I thought things couldn’t get any better and I knew that I would leave Colombia knowing I’d completed a dream. But during our last week staying on the coast we decided to go to a place called “Don Diego” because we wanted to go down the river on a tyre again, because we enjoyed it so much the first time on a different river. The other reason that we went was because we had been told that going to Don Diego river was the best chance to see some howler monkeys. Even though I had seen monkeys in “Parque Tayrona” I still wanted to see some more (obviously!). We had been floating down the river for a while and we were just getting over seeing about ten kingfishers when we went under a bridge and the guide pointed out some shadowy shapes sitting in a tree. As we got closer we saw that they were monkeys!!!!!!!!! We stopped the tyre and got out on the bank just underneath them so we could get some photos, without disturbing them. 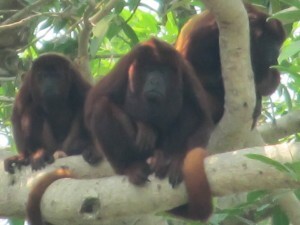 Howler monkeys are completely different to capuchins. They are much bigger, dark red and they were just hanging around quite lazily, instead of rushing around like the capuchins. We got a great view because they were on a bare branch without leaves hiding them. We carried on down the river and found out that it wasn’t just that tree that had monkeys in it, and it wasn’t just one more, it was that nearly every tree we passed had monkeys in! Around the next corner, we spotted a huge group sitting in a tree (there must have been about 15 or 20) and the guide, who had been doing this for years said that he hadn’t seen that many monkeys in one tree ever before!!! Of all the nature experiences I have had in my life these two will be the most memorable, and no one can guess how happy I was to see them. You can find more Colombian animals here. The monkey looks a bit like Kenneth! Is he endangered!? HA HA HA HA. Cheeky. Are you sure your dad likes this comment?! The monkeys we saw were not endangered but in “Parque Tayrona” there are some criticaly endangered monkeys! Yes! Such a wonderful post – I’m absolutely thrilled for you. Ivy’s wish came true…. Amazing video and photos as well. I’ve become such an avid follower of your blog, I’m beginning to get concerned about what happens once you return! Will there be an Oren and Brea in North Norfolk blog? Not sure how many Howler monkeys you’ll see while floating down Wroxham Broad or puffer fish in the shallows of Overstrand. Can’t wait to catch up with you in a couple of weeks and hear all the stories. Wow that trip was certainly one you won’t forget.how wonderful.Those howler monkeys look a bit like orangutans which I know you love. Glad you got to see them. It has been great hearing about your amazing adventures ,but be looking forward to seeing you again in a couple of weeks.